I’ve set myself on a terrifying path. I have agreed to send reports from the edge–the very knife-edge of darkness in the deepest levels of the Abyssal Rift, where a deluded cult hopes to summon an insectoid demon. I have committed myself to blogging through the whole Perdition’s Mouth campaign, from Level 1 to the deepest depths of the Abyss (currently 5 levels, though that number could possibly increase before the game’s final release). No matter how dire or disheartening the quest becomes, I can’t turn back–it’s my heroes against the darkness. Perdition’s Mouth: Abyssal Rift (previously known as Abyss: Perdition’s Mouth) is a fully cooperative horror-fantasy dungeon crawl into the heart of a demon-worshiping cult’s lair. Long ago, dwarves dug too deep and unleashed an evil on the scale of Durin’s Bane (for those who don’t catch the reference, that’s the fiery Balrog from Lord of the Rings). Centuries later, a cult has moved in, and their attempts to tear holes in reality and invoke the insectoid “god” have caught the attention of nearby do-gooders who don’t wholly approve of all this human sacrifice business. Somehow or other, the heroes of the game–a ragtag group of humans, dwarves, elves, and some even stranger types–decided to launch a mission to eradicate the cult, and the game picks up right when they reach the entrance to the topmost level of the dungeons. In many ways, Perdition’s Mouth is the perfect game for me. Though it’s set in a fantasy world, the theme is darker than usual, with heroes who are prone to injury and trauma from even the smallest battle. This more realistic take on fantasy seems like fertile thematic ground to explore; a recent computer game, Darkest Dungeon, takes a similar approach, and it works great for them, turning every dungeon delve into a high-stakes, high-tension trip…and that’s exactly what the campaign mode in Perdition’s Mouth sets out to accomplish, too. The Enemy Watchstone helps you predict what the enemies will do next. I’ve successfully infiltrated the first level of the dungeons of Abyss so far, but I want to share a few more details about the overall gameplay before I give a brief session report. Perdition’s Mouth centers on a number of unique gameplay mechanisms, some of which may seem surprising for a thematic dungeon crawl. There are no dice to be found–instead, all randomness is provided by a deck of Response cards with values ranging from -1 to 5. This isn’t simply replacing one randomizer with another, though–Perdition’s Mouth is all about calculated risks. Take attacking: your hero has a base attack stat, say 3, and the target has a base defense, say 2. To do damage, your total attack, modified by cards played from your hand, has to exceed the enemy’s total defense, modified by a card drawn from the Response deck. You and your allies can generally play as many cards as you have available to buff your attack, but you have to make the final decision before the Response card is drawn. So even a simple melee attack becomes a puzzle of hand management: should I use all my good cards to make sure the attack connects, or should I put in only the minimum necessary to beat the average Response card value of 2, risking my attack failing altogether? Defending, picking locks, and even some forms of movement all work a similar way–you have to constantly be aware of your hero’s remaining strength and where to best allocate it. The other big innovation comes in the form of two rondels, one for the heroes and one for the enemies. Like the hand management, this seems at first glance to be an anti-thematic, Euro-fied element, but it’s really all about knowing your hero’s limits. 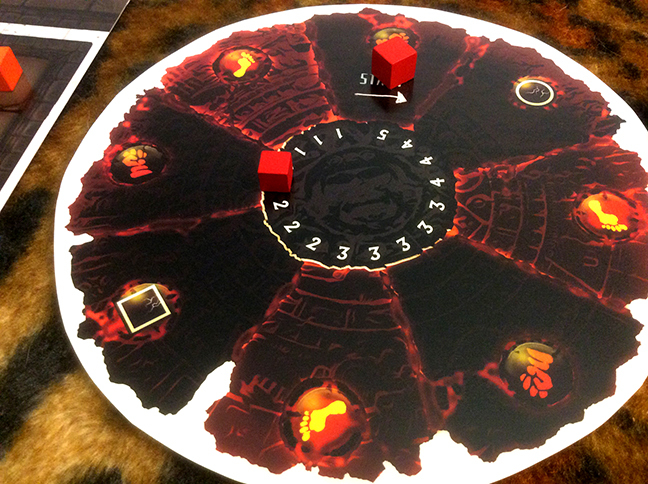 The hero rondel (called the Rock of Destiny) is the game’s action selection mechanism: each spoke corresponds to one of the 8 possible actions or action combinations. You use your hero’s AP stat to move forward on the rondel, but that same AP is important for boosting the action you end up taking, such as how hard you hit or how far you move. This means your dwarf could swing his big hammer over and over, but it would take a huge effort compared to doing something else, like defending or retreating. Or you could alternate between Sprinting and Moving to race for the level’s exit, but you’d be left too “winded” to move very far without throwing in a bunch of cards from your hand. The rondel ends up being, surprisingly, one of the game’s most thematic elements in the way it depicts heroes who don’t behave like supermen or automatons. The campaign mode in Perdition’s Mouth introduces a number of persistent effects as your heroes descend deeper into the Abyssal Rift. I will cover them all in detail in the coming weeks, but only two are relevant from the outset: wounds and threat. 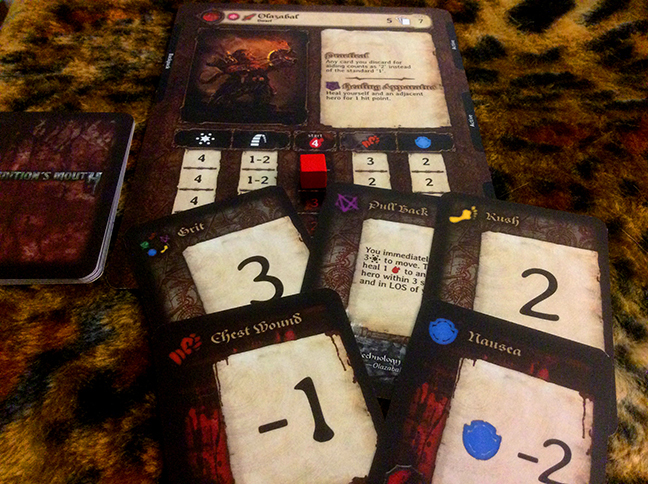 These wound cards will stay in Olazabal’s deck until she finds a way to heal them. Wounds happen whenever a hero takes damage. They are nasty wasty effects that play hell with your hero’s personal deck of special abilities and numeric modifiers (that hand management I was talking about earlier). You’ll see exactly how they work in a bit, but the important part is that old wounds die hard–these cards are not removed by simply healing the damage, and they persist in the hero’s deck throughout the campaign until they get healed. A few cheap shots on Level 1 will have long-lasting effects, something I should probably have been more careful about in my game. The other immediately obvious way that campaign mode affects the game has to do with the threat level, a small meter attached to the enemy’s rondel that determines how quickly bad guys appear on the scene. Starting threat on a standalone level is always the number of heroes (3, in my case) plus how many levels deep you are (1 for the first scenario), but several things can occur during a level to increase or decrease threat. These things are worth avoiding during a standalone scenario, but they get really nasty in campaign mode, where every change to the threat meter persists into future levels. If you let a few loudmouthed acolytes slip past and they raise the alarm, you’ll regret it for the rest of the campaign. These were the things I knew I had to look out for going in. Since this was my first time playing the game, I chose the easiest starting scenario (many levels have multiple ways to approach them, each involving different setup and special rules). That meant sneaking in via the Side Entrance rather than bashing down the main door. For my starting heroes (you can switch them out between levels of the campaign), I chose the one from each class that seemed the most straightforward: Bastian the human warrior, Olazabal the dwarven priest, and Mogba’gh, a human shaman/witch doctor who belongs to the magus class. Note: Mogba’gh, as well as other characters I may play during the campaign, is still under development and currently planned for a Kickstarter stretch goal. The same may be true of treasures, abilities, and even scenarios. It took me a few rounds to find my bearings–it seemed like I had to stretch just to make sure I got all my heroes onto the map in the first round–but after two rounds of hero and enemy actions, the game fell into an easy rhythm and revealed itself to be surprisingly intuitive, partially because of how the two rondels introduce the available actions and enemy behaviors in small, discrete chunks rather than all at once. Having just taken care of the acolyte rushing for the alarm, Bastian finds himself hemmed in by two beefy guardians. I managed to get my heroes on the board and through the first doorway within two rounds, but it quickly became apparent that I had a problem. The acolyte enemies don’t often attack the heroes directly; instead, they run for the alarm, increasing the threat level and bringing in more enemies faster. This particular scenario starts with an acolyte dangerously close to the alarm area–I calculated he would get there in only two movement actions, so I needed to make it a priority to take him out. Exerting my heroes even further, I had Bastian take the Charge action, which allows him a move followed by an attack. To make it to the acolyte and generate a powerful enough attack to make sure he’d be killed in one round, I had to play several cards from Bastian’s hand, leaving him weakened for the next turn. My second lesson is that I should pay more attention to the enemy rondel, called the Enemy Watchstone. It lets you know exactly what behavior is coming up, so you can keep track of whether you are in range when an enemy is about to attack, but it doesn’t tell you how many actions the enemies will take each round–that’s decided by the Response deck. Between this and the hand management, I feel like I barely scratched the surface of the game’s strategic potential. 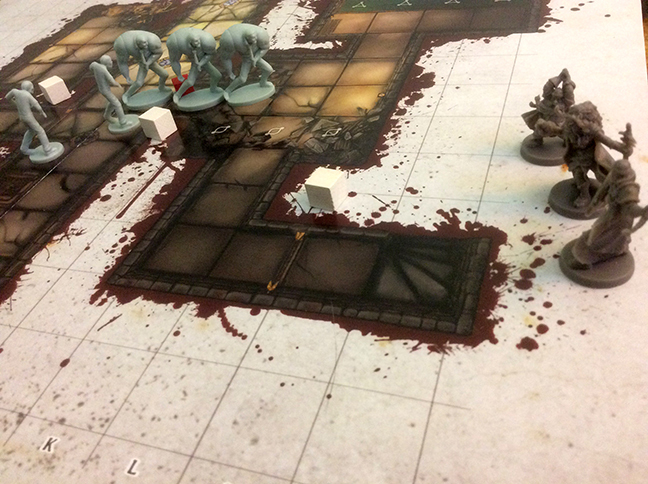 Right after Bastian killed the acolyte, two guardians moved in, blocking the warrior off from the rest of the party. While Olazabal and Mogba’gh focused on clearing a path to the exit, Bastian tried to figure out how he’d deal with the guards. After he moved in to hit one, they moved away during the next enemy movement action–the blowdart-armed guards like to stay at range. That allowed Bastian to slip past and all 3 heroes to race to the exit. The scenario ended up being pretty easy, but I was playing on the easiest version, after all. For the next part of the campaign, say hello to hard mode! The heroes made it to the exit to the level without much trouble, leaving the guards in the lurch. Unfortunately, I did not make it through completely scot-free. While trying to clear a path for Bastian, Olazabal sustained two wounds, a chest wound and nausea. As shown in the picture above, these wounds act as negative modifiers for her actions, and they can only be discarded by being played. Although Olazabal is great at healing damage, none of the current heroes had any abilities to heal wounds, so they’re stuck in her deck for now. It’s a shame, too, because she turned out to be my favorite character so far: focused on aiding and healing, but still capable of dishing out and taking damage, Olazabal is a sort of Inspector Gadget with a crazy contraption for every situation. Mogba’gh’s abilities seemed to focus on transforming actions into different actions, such as moving during a Rest action or defending during a Move, but this scenario didn’t give me much opportunity to explore that character. Bastian came across as a simple fighter type, though he may have some hidden intricacies yet to be revealed. My opinion of the first game was overall very positive: it looked like a game I would love, and it met all my expectations. It didn’t completely escape criticism, however. I did run into one issue regarding enemy movement: following the letter of the rules, there were several situations where guards moved inefficiently, blocking each other from getting into range of the heroes and failing to take advantage of the arrowslits on the map, which seemed perfect for their ranged attacks. Let me emphasize that the rules are clear that “In any situation where it is unclear where an enemy would move, the players choose the enemy’s movement.” Nonetheless, it felt like I was missing a rule, and I ended up “choosing” for the enemies to act intelligently whenever it came up. In the next level of the Abyssal Rift, Olazabal brings in two new heroes, hoping that Simma the halfling healer can patch up her wounds. Also, treasure awaits, creating another tempting persistent effect. Will the heroes take the bait? Find out in the next installment of this blog! *Note: This blog focuses on the campaign mode of Perdition’s Mouth: Abyssal Rift. 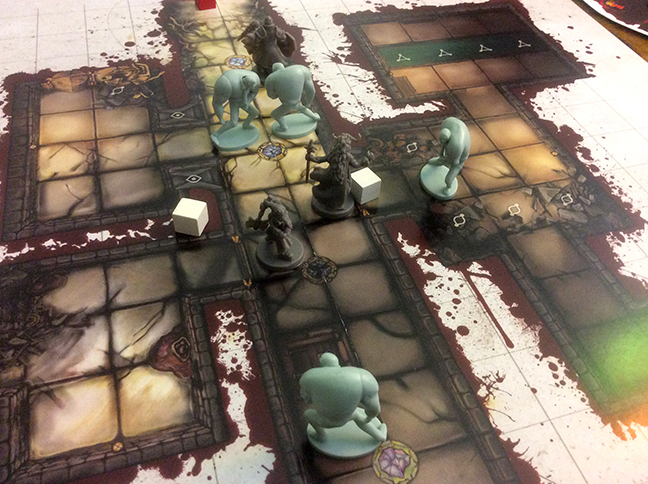 All images and gameplay details are based on a non-final prototype version of the game, and figures and other tokens have been substituted when necessary from Descent 2nd Edition, Zombie 15′, and Galaxy Defenders: Extinction Protocol.